n rights issues arising from the September 18, 2015 demolition of Badia community, which displaced thousands of families at the peak of torrential rainfall. The ADR vehicle is an initiative of the Office of Communities and Communications in the Lagos State Ministry of Local Government & Chieftaincy Affairs. Yielding to sustained pressure from SPACES FOR CHANGE, particularly the organization’s November 2, 2015 petition and meeting with state executives, the CCRF was established to avail communities disproportionately affected by court judgments and urban regeneration projects with a mechanism to ventilate their grievances. The Lagos State Government had on October 7, 2015 directed the Ojora Chieftaincy Family and Badia evictees to independently initiate steps to amicably resolve the eviction-based legal dispute between them within a stipulated 30-day timeframe. Despite several telephone and letter exchanges between SPACES FOR CHANGE and the legal representatives of the Ojora Chieftaincy Family, parties were unable to agree on a number of terms and conditions needed to jumpstart the amicable resolution of the issues surrounding the September 18, 2015 forced evictions. Upset by this holdup, SPACES FOR CHANGE and representatives of Badia East community met with Mr. Kehinde Bamigbetan and Lagos state executives on November 2, 2015 to discuss the circumstances surrounding the failure of parties to settle within the stipulated deadline. At the CCRF forum, SPACES FOR CHANGE’s Executive Director, Victoria Ohaeri thanked Mr. Bamigbetan for making good his promise to expediently set up the ADR process. She gave a detailed explanation of the difficulties SPACES FOR CHANGE has had with Ojora family, including the continuation of attacks on the evictees’, the fencing of the demolished land and the continuing depletion of the evictees’ economic resources. In response to the proposal offered by the Ojora Family, she tabled three negotiation proposals for compensating the evictees such as outright buyout of community land at prevailing market rates; preferential land regularization scheme for homeowners; and a dedicated social housing program that gives evictees the right-of-first-purchase or rent-to-own mortgage option. Mr. Bamigbetan updated on the steps he had taken to address the key issues raised in SPACES FOR CHANGE’s petition. One such critical issue is Badia evictees’ insistence on negotiating for fair compensation terms at a neutral venue where they can freely ventilate their grievances and contend with the lopsided power imbalance between them and the Ojora family. Not only that, the nature of the contentious issues arising from the demolitions and forced evictions warranted an unbiased forum that would inspire community confidence in the process and to balance power relations during the conversations. On that basis, the evictees rejected the Ojora family’s proposal for the mediation dialogue to be convened at the Kabiyesi’s palace. 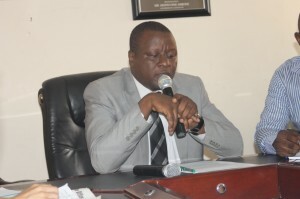 Mr. Bamigbetan replied that the Lagos State Government takes the office of traditional rulers very seriously, and in order not to undermine that traditional authority, he would advise that the evictees agree to take part in the subsequent mediation meetings that would be held in Ojora’s family palace. This plea probably influenced the evictees to soften their position, and they consented to participating in subsequent mediation meetings at the Ojora family palace. To deepen confidence in the ADR process, state executives assured Badia evictees of reinforced security and state government presence at all subsequent mediation dialogues that will be convened at Ojora’s palace. In his closing remarks, he informed that having visited the demolition area and seen the extreme levels of hardship suffered by the community members, he will personally lead the advocacy for the restoration of their dignity to the Governor of the State. The mass demolition of informal communities by private persons with the support of state departments has become so common in Lagos State that residents, whether poor, rich or middle class, live in terror of the pain inflicted on the affected people. SPACES FOR CHANGE is determined to use every legal means within its disposal to bring the Ojora family and the Lagos State Government to justice over the demolitions and violations of housing rights of Badia people.